Over one crazy weekend, long-time married couple Ruth (Diane Keaton) and Alex (Morgan Freeman) discover that selling their Brooklyn apartment isn't about winding down, but starting a new adventure. After living in their apartment for 40 years, Ruth and Alex have a hard time imagining living anywhere else. The retired couple let Ruth’s niece list their property to see how well it would do in the market now that their neighborhood is hip and trendy. The pair realize their bond is the most important thing and will guide them through the chaotic adventure. "Change in life...happens! I personally loved this show!" "I saw this film at TIFF last September when it was called RUTH AND ALEX. It's a sweet yet completely forgettable film. The only thing that saves it from being really dull are the fine performances by the two great stars. 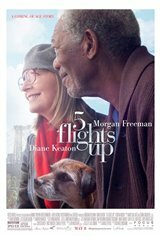 Diane Keaton and Morgan Freeman have great chemistry and they seem to really enjoy working together. The best performance of all is their dog Dorothy who steals the scenes she's in."